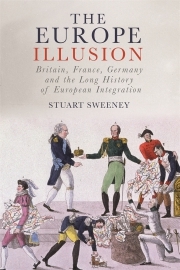 In The Europe Illusion, Stuart Sweeney considers Britain’s relationships with France and Prussia-Germany since the map of Europe was redrawn at Westphalia in 1648. A timely and far-sighted study, it argues that integration in Europe has evolved through diplomatic, economic and cultural links cemented between these three states, and that – as wars became increasingly destructive and economic expectations were elevated – states struggled to survive alone. Yet it has been rare for all three to be friends at the same time. While common trends can be seen within the European states, there is an illusion of unity, since cultural particularisms have always tempered full integration. In this broader context, setbacks like Brexit can be seen as predictable and manageable. After all, the federal project has a strong pedigree, with roots in the Holy Roman Empire, and the EU remains a formidable institution of twenty-seven states. While Britain is left to forge a role outside the EU, Sweeney identifies a familiar semi-detachment, highlighting pragmatism and historical constancy at the heart of Europe. Stuart Sweeney is a visiting academic at the Centre for European History, University of Oxford, and has taught at Oxford and Open Universities. His first book was Financing India’s Imperial Railways (2011). He lives in Richmond, Surrey.